EXPAT radio station iTalk has taken on three new presenters including a British soap star and a Cordon Bleu-trained chef. The first recruit to DJ Maurice Boland’s venture is actress Debbie Arnold (pictured here) who is certainly no stranger to showbiz. Arnold took an early job on as a Marilyn Monroe impersonator and later starred in The Bill, Birds of a Feather, The Russ Abbott Show and several soaps including Coronation Street and EastEnders. Hew new show Debbie Does Radio is aired on Sundays at 2pm. Meanwhile US food expert Chef Sonny – who attended the Cordon Bleu in Paris no less – can be heard on weekdays from 3-5pm. 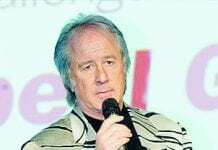 Also joining the station is John Martin, a former columnist for the Entertainer (now the Euro Weekly News) who will be presenting a program on Saturday and Sunday evenings. I wonder would this be an attempt to gloss over the fact that Ritchie Allen, Steven Ritson and Barry Mitchell have walked away from Maurice in the last two weeks? Hmmmm. . . . .
Give it a rest Gordon … all you do is whinge ….. no one cares about your silly comments… Maurice is an outstanding Presenter with a wonderful radio station. You are an idiot. Agreed Lynne. iTalk is doing a fab job in very tough economic times. Yes they’ve lost a few presenters who wanted to work for more than expenses(this is the way it is when a station starts out), but they keep on going and I must say that Chef Sonny is supremely professional; with a voice for radio indeed! THEY EVEN FOUND TIME TO RAISE OVER 18,000 FOR THE FIRE AID CONCERT – WITH THE HELP OF VOLUNTEERS THAT IS. hmmmm. Media Mogul – Outstanding Presenter…. are we talking about the same maurice boland here. And before you say anything, I am not a maurice boland hater, i just know a good presenter when i hear one. Oh, and one last thing, His station may be here to stay but maybe he is going to be having to look for a new frequency in a couple of months time.